In case you were wondering where I’ve been… why I’ve been gearing out my new Level 80 Paladin. Although, I did start out ahead with several crafted pieces and lots of honor from pvping during those early levels. A month later and I have healed the first wing of ICC 10 twice on my pally, have mostly ilvl 232 gear and some ICC pieces. I’ve also dual specc’d into tanking….which has been a new experience. In fact several weeks ago when Udluar was the weekly raid I ended up off-tanking Ignis, Razorscale, and XT-002, netting me the Seige of Ulduar achievement. It was one of those, oh hey lets go do XT-002 while we are here, oh wait, who’s off-tank? Then, they realize that their usual healer is on her toon with the dual tank spec. It’s moments like these that I always carry around all of my off-spec gear, so that my guild can pull crazy stuff off that they wouldn’t normally be able to do. Yes, you’re reading that right. That is what I have to deal with on a monthly basis for the opportunity to get easy epics from this mythical place called Vault of Archavon. (Btw, how many folks actually remember the Archavon fight anymore? Noticed that lack in your pugs lately?) Sadly, the horde manage to win regularly on Monday evenings (don’t ask me why but it’s been true for the last 3 weeks) between 12am and 1am my time and 9-10pm server time (I’m EST the server is PDT). So if I’m not half asleep at my keyboard we can manage a guild run into Vault. Yay! Since I can’t pug even when the Horde has WG due to runs that fall apart after the first wipe on the frost boss, this is an exciting opportunity for me. The truely sad part is that I love to battleground pvp on my priest and it’s like this even in the actual battlegrounds. So all the alliance out there belly-achin’ because the horde always win in your battlegroup, guess what, you’re in the wrong battlegroup! 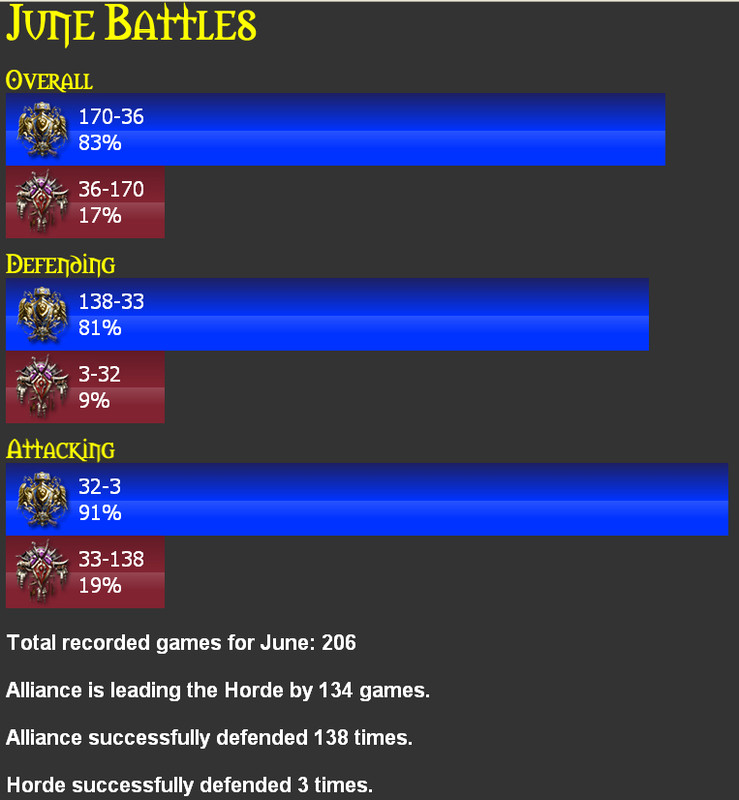 I’m so looking forward to Cataclysm so that at least the AB, AV, and WSG fights will hopefully be thinned out with horde that can actually win a BG! This entry was posted in Paladin, PvP, Raiding by Makakai. Bookmark the permalink.